On September 11th, while patriotic Americans waved flags and listened to speeches, a few thousand miles south, Chileans massed in the streets and clashed with police on the anniversary of the 1973 military coup. Our 29th episode begins a two-episode series on anarchism in Chile: From popular power and militant resistance to the Pinochet dictatorship to today's clashes between encapuchados and Carabineros across burning barricades, we explore the history and background context necessary to understand the distinctive and militant anarchist struggles of contemporary Chile. From the recent anarchist book and propaganda fair in Santiago, several anarchists speak with us about the importance of radical neighborhoods, the evolution of public anarchist organizing, and political imprisonment in Chile. Attendees of the marches and actions during the recent Climate Convergence in New York City report on their experiences and reflect on how anarchists connect to broader environmental movements. Listeners weigh in on historical dates, pronunciation mistakes, and mind-controlled drones, alongside news, announcements, and prisoner birthdays. Our discussion of the history and background context of anarchism in Chile draws heavily on the 2009 article “Chile: From Popular Power to Social War,” which appeared in Rolling Thunder #8, along with contemporary updates. One of the best sources about the history and contemporary reality of anarchist struggle in Chile can be found in the documentary The Chicago Conspiracy by our friends at Subversive Action Films. Tune in next episode for a full review of the film on the Chopping Block. For contemporary reports on anarchism in Chile, see HommoDolars (counter-information in Spanish); you can find translations of many communiques and reports on actions via the blogs War on Society, Contra Info, and 325. Felipe, who we interviewed, is part of Social Communication Productions. Political repression cases: the Banco Security case, the “Caso Bombas” (Bombs Case), Monica Caballero and Francisco Solar, Victor Montoya, and Tamara “Sol” Vergara. Anarchists and militants who died in the course of struggle: the Vergara Brothers and the Day of the Youth Combatant, Mauricio Morales, and Sebastian Oversluij Seguel. Other historical references: Popular Power in Allende-era Chile before the military coup; 1920s Argentine insurrectionist Severino di Giovanni; the foco theory of guerrilla warfare; if there are others we mentioned about which you want sources to learn more, just drop us a line! To learn more about the Mapuche struggle, see the Chile Bolivia Wallmapu blog, especially the article “The Intensification of Independence in Wallmapu”. For more on Chile’s economy: the article “Anatomy of an Economic Miracle” from Black Flag Magazine in 1999 critiques Chile’s neoliberal experiment that was so admired by free market pundits. Naomi Klein expands on these themes in her 2007 bestseller The Shock Doctrine, which is well worth a read. An Al-Jazeera feature from last year titled “The Other Side of Chile’s ‘Economic Miracle’” grounds these critiques in contemporary realities. To learn more about the resistance to environmental destruction at the ZAD du Testet in southeastern France, check out the occupation’s blog, this short film in French, and the latest episode of The Final Straw, which features an interview with folks from the occupation. For news about the original Zone a Defendre (ZAD) anti-airport occupation in Notre-Dame-des-Landres, stay posted to zad.nadir.org. PLEASE TAKE A MINUTE TO READ this newly updated Cell Phone Guide for US Protestors from the Electronic Frontier Foundation. It gives extremely useful suggestions about pre-protest preparations, encryption, court cases and legal precedents, what to do if arrested, and so forth. The more you know, the less they know! Looking for more anarchist media projects to watch or listen to? Check out the new episode of “It’s the end of the world as we know it and I feel fine” by the Stimulator, titled “Ferguson: Chronicle of an Insurrection”, featuring an in-depth look at the anti-police riots in Missouri we covered in Episode 27, as well as an interview with anarchist Black Panther Ashanti Alston and lots more. The latest episodes of The Final Straw include an interview with Indiana anarchists supporting rebellious prisoners in the Pendleton Correctional Institution, former political prisoner Jerry Koch speaking on Luke O’Donovan’s case, and a discussion of the ZAD du Testet in France. Free Radical Radio also has a new episode out with discussion of the Climate March in NYC and an interview about the website ultra-com.org. This news broke too late to make it into this episode, but our fellow CrimethInc. 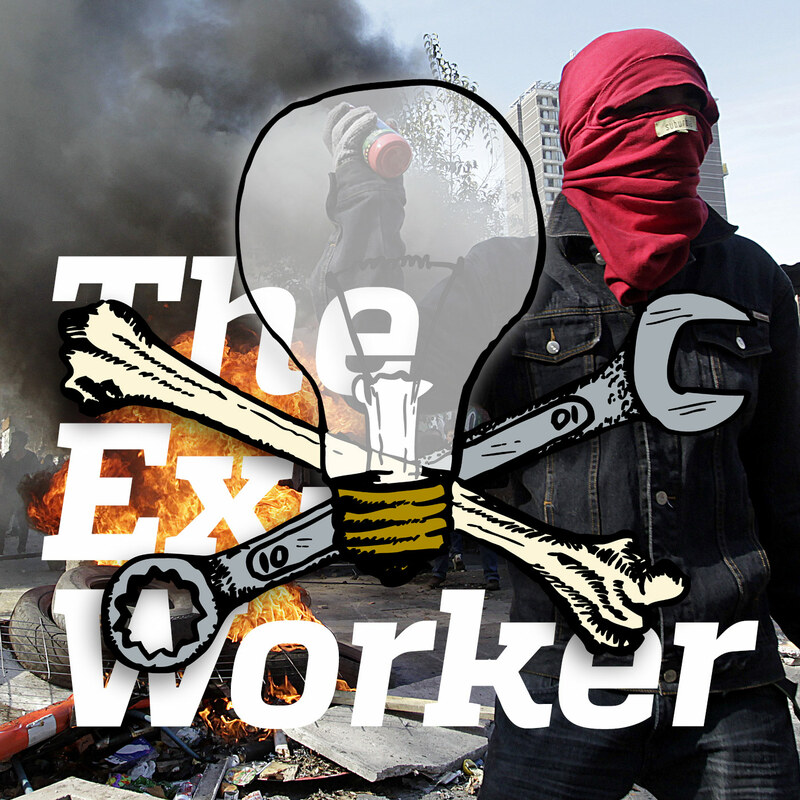 Ex-Workers are finishing up a hugely ambitious new multimedia outreach project, To Change Everything, intended to introduce anarchist ideas to a broad audience. The centerpiece of the project is a 48-page pamphlet, of which our fellow Ex-Workers plan to print 100,000 copies to distribute for free. They are currently raising the funds for this via a Kickstarter campaign; learn more here, and help out if you can! News from the Hot Wire included: a Kansas City anarchist arrested on charges of attempting to firebomb a politician’s office; more racist police shootings in Utah, Louisiana, and South Carolina, plus cops acquitted for a previous murder in Ohio; police chief’s daughter arrested for her role in a brutal gay bashing; G20 defendant Joel Bitar paroled and released from prison in Canada; youth in revolt in Utah and Colorado; protests against sexual violence in Calcutta, India; paramilitary raids by private security on California pot farms; Tokyo anti-nuclear protests; revolt by Chinese shellfish farmers; repression at the Hambacher Forest occupation; anarchist support for striking public workers in Helsinki, Finland; demos in memory of Greek anti-fascist rapper Pavlos Fyssas, or Killah P, in Athens, Greece, Cyprus, and elsewhere; pharmaceutical lab destroyed by fire and immigration removal center riot in the UK; and an Animal Liberation Front raid on Italian fur farm.